The port of Lochinver is the largest settlement on the west coast of Scotland north of Ullapool. The main road north runs well inland here, and a visit involves a ten mile each way detour along the A837. It's well worth it. Even better, for those wanting a more adventurous journey, are the single track coastal roads from Achiltibuie via Invekirkaig to the south, and to Kylesku via Clachtoll and Drumbeg to the north. Lochinver feels like a number of different places, all rolled up into one. 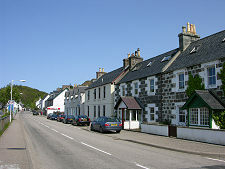 Its heart is the main street running along the eastern end of Loch Inver. 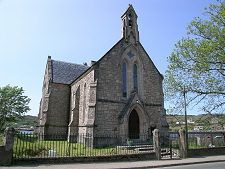 This contains the main shops and services and is focused on the striking war memorial on the shore of the loch. Facilities including a petrol station, a post office, and a small supermarket, plus other shops and places to eat and drink. An unsigned turning off Lochinver's main street a little south of the closed visitor centre leads eastwards to Glencanisp Lodge, one of the most stunning holiday homes in the country. It is best known, however, as the start of the most popular - if still very long - route to Lochinver's most outstanding feature, Suilven. You can find out more about Suilven here, but wherever you go in Lochinver, your eyes are drawn to this seemingly impossible policeman's helmet of sheer sided rock. In reality its highest point is a "mere" 2,389ft in height and though a long walk, Suilven is not a difficult climb. And spare a thought when admiring Suilven for Canisp, the rather larger and more distant mountain that also features in views over the village, usually seen to the left of Suilven. Anywhere else it would be a star in its own right: but not here, in the presence of its much smaller neighbour. At the southern end of Lochinver is its harbour, the busiest of the 102 harbours and jetties in the Highland Council area. Here you are likely to see vessels from many parts of the world. Most are involved in some aspect of fishing, many landing catches at the large fish market. 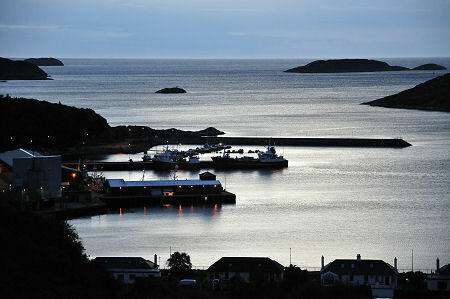 The importance of Lochinver's harbour was reflected in work done as recently as 1992 to extend the piers and facilities. Few would describe the harbour area as pretty, but it exercises the fascination common to all working ports: and few can offer a setting like Loch Inver, or a backdrop including Suilven and Canisp. Close by is Lochinver's most imposing building, the Culag Hotel. This was built in 1873 as a shooting lodge and incorporated the buildings of an existing herring station into its service wing. It was largely rebuilt following fire damage in 1939 and, like the harbour, has seen significant recent extension. 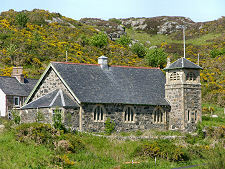 Another striking building at this end of Lochinver is the Royal National Mission to Deep Sea Fishermen. 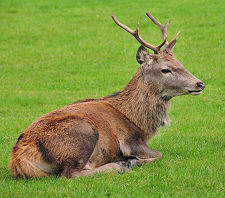 This part of the village offers one of the best views of another of Lochinver's hotels, the superb Inver Lodge Hotel perched on the hillside that rises steeply to the east of the village. At the other end of the main street, Lochinver continues around the northern side of Loch Inver into a newer, more spread out area of development. Access is via a single span stone bridge built in 1821 which takes you behind the Free Church in its sheltered position looking back towards the main body of the village. Returning traffic uses a more modern bridge further north. There are two main reasons to come round this side of the loch. 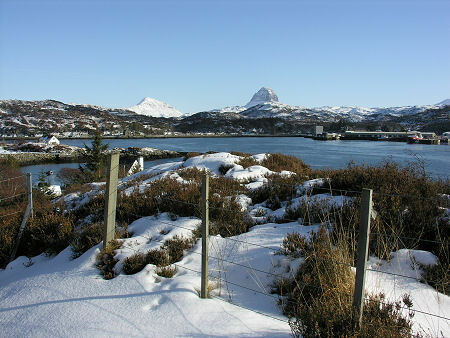 The first is that it offers the very best views back across Lochinver to Suilven. The ideal viewpoint is an increasingly overgrown rocky knoll beside the road as it begins to climb the hillside. Parking is a challenge, and fighting your way through the bushes and gorse the 20 feet or so to the top gets more difficult on each visit. But once there you are standing on one of the best low level viewpoints in northern Scotland. The second reason to come round the northern side of Loch Inver can be found at the well-signposted Highland Stoneware pottery. This comprises a large modern shop displaying an amazing selection of the output of the pottery: plus the pottery itself where you can watch the stoneware being made and decorated.